Renaldo 'Swiperboy' Woolridge and former Tennessee safety Eric Berry. Well it looks like Tennessee is at it again. Reports surfaced earlier this week that Volunteers basketball player/aspiring hip hop artist Renaldo Woolridge may have violated NCAA compliance regulations. Like Vols coach Bruce Pearl didn’t have enough on his plate. To no one’s surprise Tennessee officials have vehemently denied that Woolridge — perhaps better know for his skills with a mic than with a ball — received any improper benefits when he allegedly rented the upstairs room of a Knoxville campus bar to shoot his newest video fo’ free. UT officials said that research done by the school’s compliance staff found that no violation occurred because nothing was recorded and Woolridge simply was scouting the location for possible future use. Woolridge’s talents as a hip-hop artist under the name “Swiperboy” are well-documented, and his music videos have been shown at UT football and basketball games. He has been working exclusively with the Volunteers’ scout team, has played in only two games since the end of November and did not dress for Saturday’s loss to Connecticut because of an ankle injury. The drinking establishment in question, the New Amsterdam, apparently wasn’t on the list of campus bars Vols football and basketball players were banned from frequenting after reports surfaced that a number of players weren’t charged a cover on Thursday nights at another Knoxville bar eloquently titled Bar Knoxville. Regardless, UT’s findings completely contradict statements made to the Knoxville News Sentinel from an unnamed source apparently with intament knowledge of the New Amsterdam. “It was given to him by the New Amsterdam for free because we do support him and UT sports in general,” the source said. The cost for leasing the room for special occasions was not available. It seems there’s one easy way to get to the bottom of this caper — watch the music video. Unfortunately the video for Swiperboy’s newest single “Snap Back” appears to be a pretty ambitious project, as the part shot (or not shot) at the New Amsterdam was only small portion. 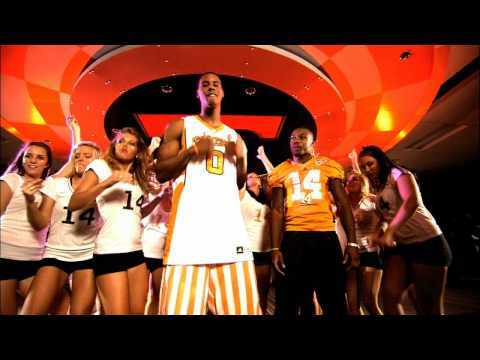 And if Woolridge doesn’t want to hire dancers he can always bring back the Vols’ recruiting hostesses. Good work, Bart. You do a good job of getting keywords into the headline and lead. Solid links, love the pic.